Veronica (on the left) and Carrie (on the right) at the NWSC Seattle office in fall 2018. Sitting across from these two women, one could easily mistake them for cousins or long-time friends. They laugh and talk excitedly to each other, giving updates of their families, swapping stories and showing photos on their phones. The photos are not of their own kids, though. Both Veronica and Carrie are employees with Northwest Surrogacy Center (NWSC), and they are also both former surrogates with NWSC. After a few years of part time work, they were hired fulltime in early 2018 to help fill vital roles at the company. With a mix of professional experience and the firsthand knowledge of surrogacy, they provide a unique perspective to the company. Veronica delivered healthy twin girls for the French family. The experience was so fulfilling, she returned to NWSC for a second surrogacy and she delivered a baby girl for an Australian couple. With over 10 years of event planning and community advocacy, along with her own surrogacy experiences, NWSC brought Veronica on as an employee in their Portland office. 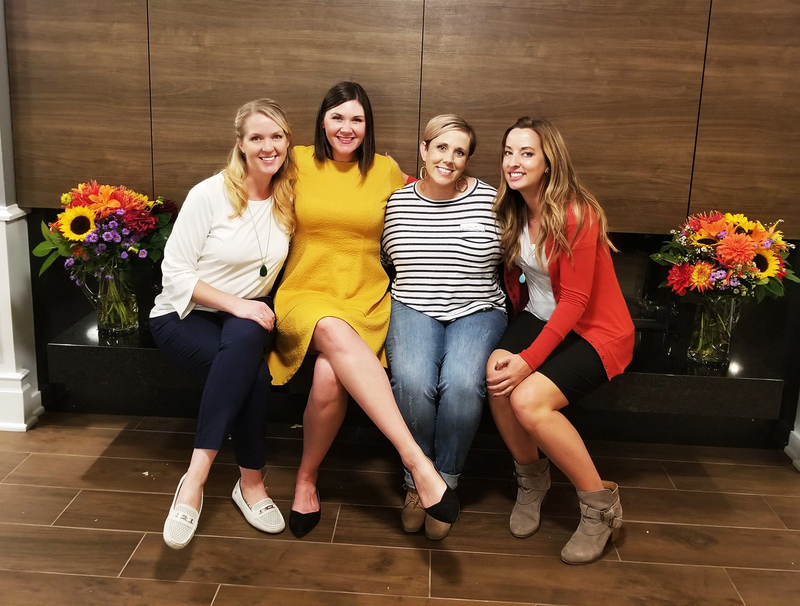 She now plans events across the West Coast for surrogates and intended families, she helps intended parents prepare for the birth of their baby and helps refine the overall surrogacy experience. She is also available to connect with any potential surrogates who have questions about the process and her experiences. Her smile grows when asked about her initial reaction to the job offer. “I was so excited. I believed in NWSC as a company so much and this was a way to continue working in the surrogate world, beyond helping create families through my own surrogacies,” she says. Pulling up some seriously adorable photos of her surrogate babies (surrobabes, as Veronica and Carrie call them), her excitement is contagious. The smiles on the parents faces, the joy of the baby’s pudgy cheeks – it’s easy to see why she wants to help others experience the same things. But it’s not just the joy of a healthy surrogacy that fills her days. She answers the hard questions, too, and has candid conversations with surrogates who might be facing a challenging situation. Carrie tells her introduction to surrogacy as a chance happening. A friend confided about fertility struggles and mentioned that she and her husband were looking in to IVF, surrogacy and adoption. This conversation replayed in her mind, and she realized she knew nothing about surrogacy. Carrie and the family she worked with formed a very close bond, and NWSC invited her to speak at an event in San Francisco about her experience. As the company expanded, they liked the combination of her marketing background and her experience of being a surrogate. In addition to her Marketing Manager job duties, she also helps the surrogate intake team with interviews and works with Veronica to execute events and to continually improve the surrogacy experience. The two have separate job duties and roles, but they work closely on certain projects. To do this, Veronica and Carrie have begun monthly meetups in 9 cities throughout the 4 states where NWSC works, and these provide a casual, kid-free time for surrogates to chat and trade stories. They’ve also started a private Facebook group for NWSC surrogates, surrogate t-shirts, annual appreciation parties in 3 states (Washington, you’re next! ), and now have meals delivered to the surrogate’s home after the baby is born. Another area they’re refining is the time in the screening process where a woman requests her pregnancy medical records to be reviewed by NWSC and the fertility clinic. This is often the longest part of the entire screening process, and Veronica and Carrie are working hard to keep the women engaged and excited during this time, while also working to shorten the waiting time. “I bought every pair of unicorn socks Target had to use as gifts,” Veronica says, showing a photo on Instagram of a surrogate in the fun, sparkly socks. “We’re using our professional strengths, personal experiences and passion for helping families grow. We meet amazing women and have the best co-workers,” Carrie says. The next big project is one 25 years in the making, Veronica says. In 2019, NWSC will celebrate its 25th anniversary with a large event in September. They are also working hard to finalize programs and outreach to Washington state, as compensated surrogacy will be recognized there in 2019. And as the programs evolve in Oregon, California and Colorado, there’s plenty of growth ahead in 2019.